Public holiday, yay! Come by the Marina Club at Sutera Magellan if you have time and are interested to see Red's latest art work, which will be slowly revealed over the next two days, with the media covering it on Saturday, 26th January 2013. This is Red's first installation in her hometown and is even more special because today is her birthay. I spent the whole night making a pastel layer cake for her (Martha Stewart's) and her crew but am so disappointed because the cake turned out heavy and rubbery. She has never had a store-bought cake for her birthday but this year she will. I went scuba diving last week and didn't meet any sharks. I did, however, snorkel among plastic bottles and baby diapers. Such is the state of the waters at the islands off Kota Kinabalu. Now that the timber is gone, the oil and gas are 'hijacked' and the palm oil prices have dropped, it is more crucial than ever for Sabah to safeguard the last remaining resources--its rainforests, beaches and seas. And yet, a walk along Tanjung Aru Beach is a saddening experience. There's thrash everywhere and the air stinks. Why have the food stalls on that beach? Why can't it be a park? Anyway, here are some pics from my first scuba dive. I was too nervous (hate deep blue waters) to really enjoy myself, and I had trouble equalizing the pressure; my ears hurt and I feared that my eardrums would pop. I thought I'd panic and forget how to replace the the oxygen regulator so I cheated by holding on to it all the time. The water wasn't as clear that day because of the rain we've been having, but we did see some colorful fishes (one had colorful dots AND stripes, the full monty!) and corals. It's a different world underwater but I was relieved when I saw the poles and flippers because it meant we were near the surface. I think I'll stick to snorkelling. 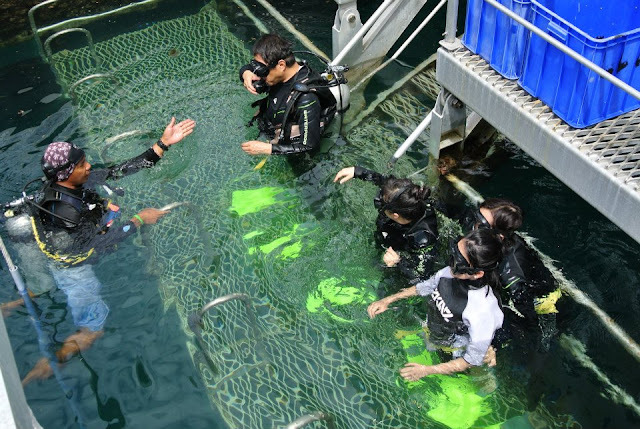 Check Borneo Reef World's website here. The boat that took us to the pontoon. Crash course by the dive master. The pontoon, largest in South East Asia, measures 888 sq meters. Pian Er Chuan Mian (I can't decipher the meaning) is a popular noodle dish in Hangzhou, China and I've always wanted to make it but I couldn't get hold of yellow chives, fresh winter bamboo shoots and fresh straw mushrooms at the same time. With Chinese New Year a month from now, most supermarkets are stocking their shelves with Chinese goods, including veggies. Thai Seng next to Kian Kok School is busy with shoppers and I enjoy going there for Chinese veggies such as lotus roots, sweet pea sprouts and kailan stems. Sometimes they even bring in yellow chives, a very fragile veggie that wilts and sweats almost as soon as it is unpacked from the box. I think yellow chives are grown the same way as white asparagus, that is, without sunlight and so both the green and yellow/white variety are the same specie. Tastewise, yellow chives are sweeter than ordinary green chives and more tender. Chinese chives, btw, are not the same as western chives. Chinese chives are flat-bladed and have a strong garlicky smell, and are even more pungent than green Chinese chives. Upper row, left to right: straw mushrooms, yellow chives, fresh wheat noodles. Lower row, left to right: pork, Chinese ham, xue cai, fresh bamboo shoots. The noodles are fresh wheat noodles, much like ramen noodles. Do not use Cantonese wonton noodles or local oily wheat noodles. This is one tasty noodles dish, especially with some thick chili oil paste. 1. Marinade the pork with 1 T light soy sauce, 1 t corn starch, 1 T water & 1/2 t sugar for about 1 hour. Fry the pork in 1 T veg oil until just cooked. You can do this ahead. 2. Simmer the stock with the ham in a covered pot for about 1/2 hour. Top up the stock if it is reduced. This can also be done ahead. 3. Bring a large pot of water to the boil and cook the noodles, stirring well to loosen the strands and cook evenly. (While noodles are cooking, keep the soup simmering in another pot.) Check by breaking a strand of noodle with your fingernails. The noodles are cooked when there's no white uncooked dough in the center. Do not overcook. Drain the noodles. 4. Heat up a wok, add the lard and oil and fry the xue cai, mushrooms and bamboo shoots. Add the stock and season with 1 T rice wine/ Shaoxin wine and salt and white pepper to taste. Bring to a rolling boil and add the chives. Turn the heat off. 5. You can serve the noodles in individual bowls or in one big pot, adding the boiling soup to the noodles in the bowls or pot. Serve immediately. A new year! Like new clothes, a new year gives new chances to improve, to change and to be different. I wish all readers a best new year of possible impossibles! I was craving for something deep fried such as salt and pepper squid a few days ago because I've been dieting and my body was screaming for something, anything, other than veggies and steamed fish. Couldn't get really fresh squid (hate the frozen ones) so I used chicken instead. My favorite part of the chicken is the drumstick and S & P drumstick seemed too bland. What could I season the drumsticks with that's not too spicy yet not too bland? 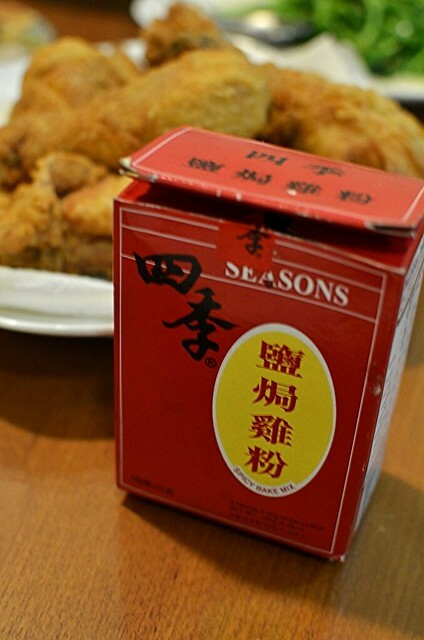 This is not a sponsored post (you'd have noticed that I never do sponsored offers because I want to stay unbiased) for Season's seasoning mix, a product from Hong Kong. Although Season's seasoning mix is called 'Spicy Bake Mix', it isn't spicy at all. I think the Chinese words 'salt baked chicken' was lost in translation The seasoning mix smells of Chinese 5-spice powder, a smell that always reminds me of Chinese grocers shops in Canada's Chinatowns. I know there's msg in the stuff, but life's too short to always eat right. The seasoning mix (there are five packets inside one box of mix, I think) is also good rubbed all over and inside a whole chicken (about 1.5 kg) which is then baked at 180 C for an hour and a half. Chop the baked chicken to serve a la Chinese style. Although it's just simple Chinese shake and bake chicken, my jaded family was impressed, so I thought maybe you would be too. Great for times when you don't know what to cook when the family has eaten all your dishes too many times. 1. Trim thick fat off the chicken thigh but try to leave as much skin on as possible. Joint the legs, chop the drumsticks into half if like ( I prefer them whole) and the thighs into 3 parts, making 12 pieces altogether. 2. Season the chicken pieces with 1/2 to 3/4 packet of the seasoning mix and the salt. Add an egg white and massage into the chicken. Cover and leave in fridge for an hour. 3. Put the flour(s) and one packet of seasoning mix into a clean plastic bag and shake to mix well. 4. Put a piece of chicken into the bag of flour and shake well to coat. Coat all the chicken pieces likewise. 5. 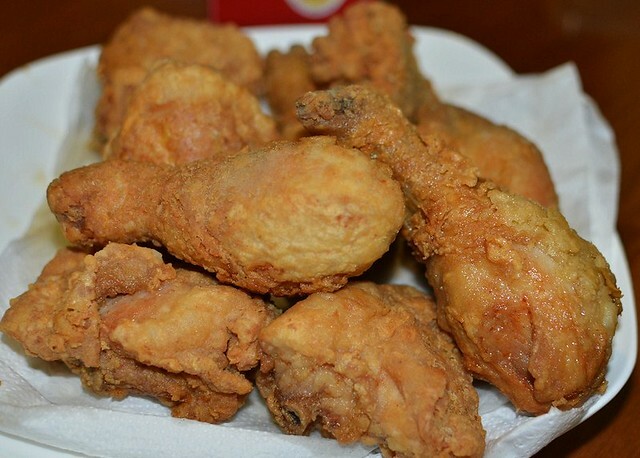 Deep fry the chicken in 3 to 4 batches in medium-hot oil for about 10 minutes or more until well-cooked. Drain on paper towels. When all the chicken is fried, return them to the hot oil (careful!) in one batch and fry for one to two minutes. Re-frying makes the chicken crispier. Remove with slotted ladle, drain on paper towels and serve immediately.